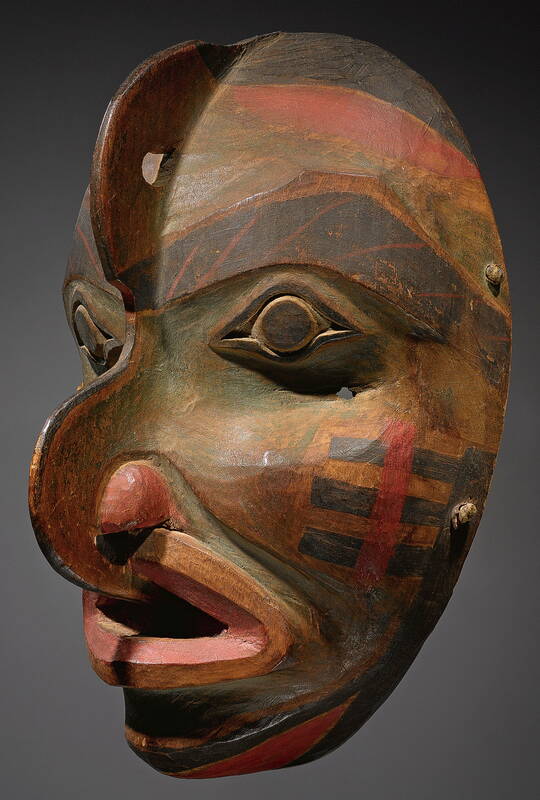 The Indigenous peoples of the Pacific Northwest Coast are the pre-Columbian inhabitants of the Pacific Northwest Coast, their descendants, and many ethnic groups who identify with those historical peoples. They are now situated within the Canadian Province of British Columbia and the U.S. states of Alaska, Washington and Oregon. The indigenous peoples of the Pacific Northwest Coast at one time had the most densely populated areas of indigenous people. 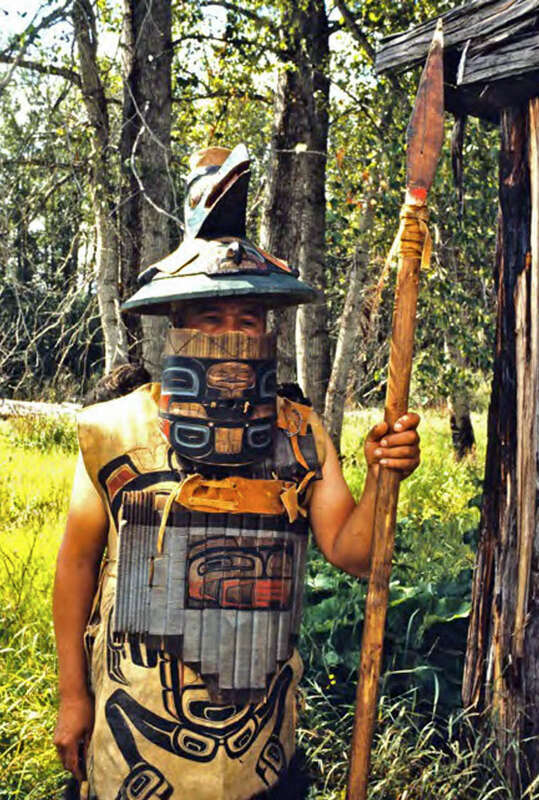 The land and waters provided rich natural resources through cedar and salmon, and highly structured cultures developed from relatively dense populations. 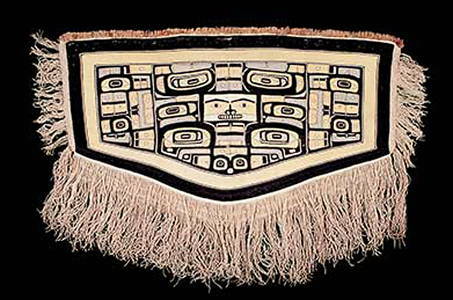 Within the Pacific Northwest, many different nations developed, each with their own distinct history, culture, and society. 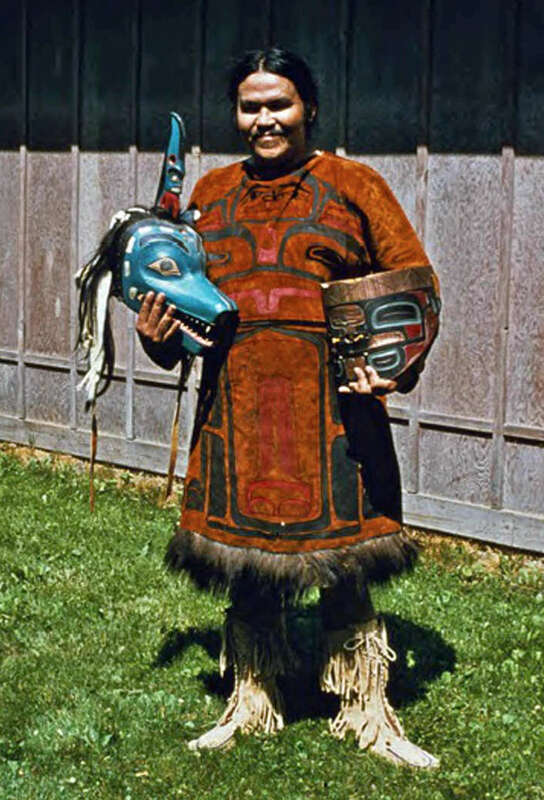 Some cultures in this region were very similar and share certain elements, such as the importance of salmon to their cultures, while others differed. Prior to contact, and for a brief time after colonisation, some of these groups regularly conducted war against each other through raids and attacks. Through warfare they gathered captives for slavery. 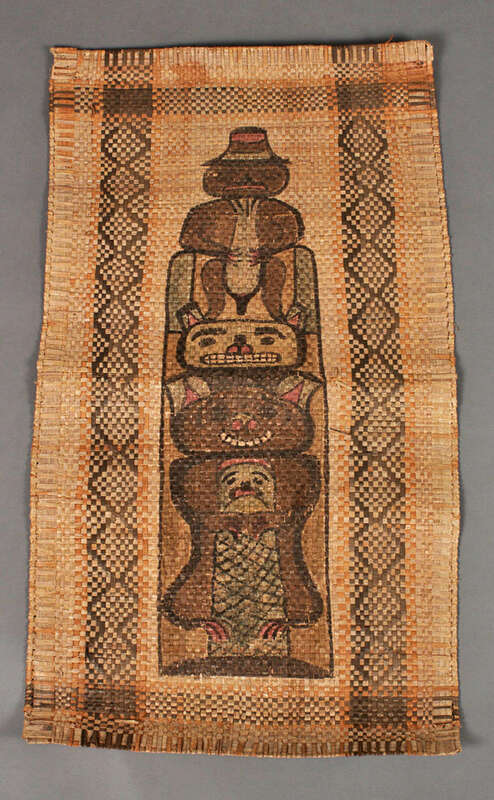 The creation of beautiful and practical objects (for all tribal communities) served as a means of transmitting stories, history, wisdom and property from generation to generation. 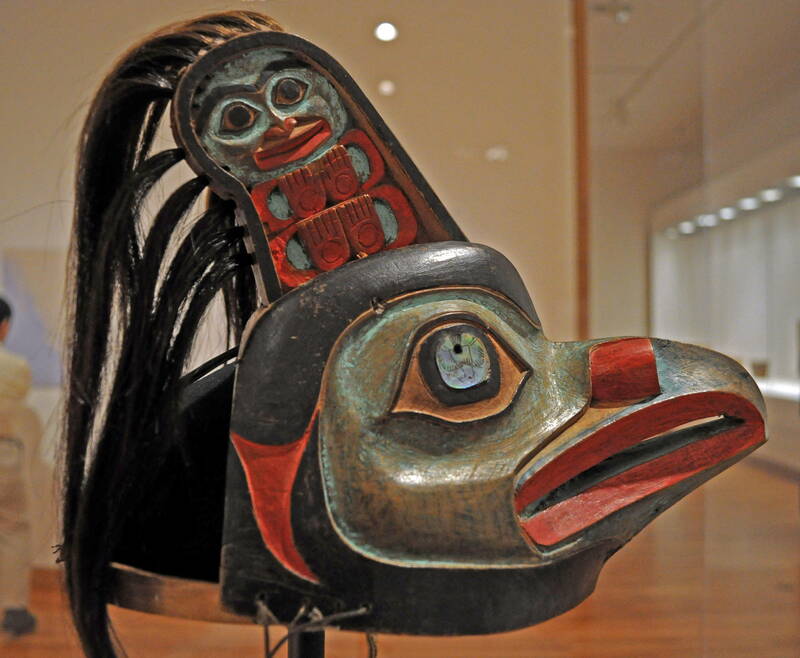 Art provided Indigenous people with a tie to the land by depicting their histories on totem poles the Big (Plank) Houses of the Pacific Northwest coast – the symbols depicted were a constant reminder of their birth places, lineages and nations. 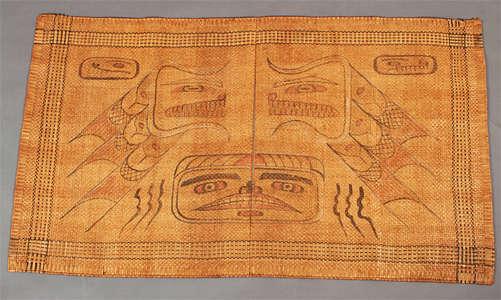 Due to the abundance of natural resources and the affluence of most Northwest tribes, there was plenty of leisure time to create art. Many works of art served practical purposes, such as clothing, tools, weapons of war and hunting, transportation, cooking, and shelter; but others were purely aesthetic. The First Nations people of the Northwest Coast have a very rich tradition of hats, cloaks, body armour, and masks. Before Europeans arrived and introduced cloth, most coastal people wore minimal clothing. 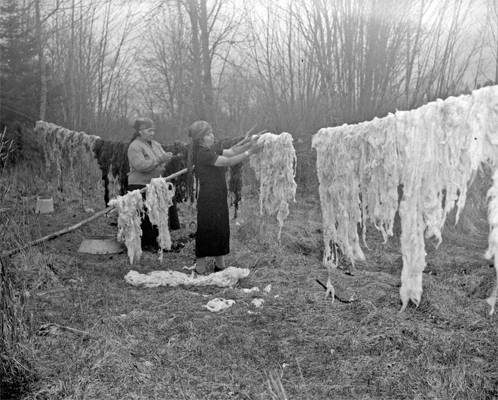 Men went naked when weather permitted and women would wear a simple skirt made of shredded cedar fibre. Both sexes wore woven bark capes and spruce root hats as a protection from the rain. 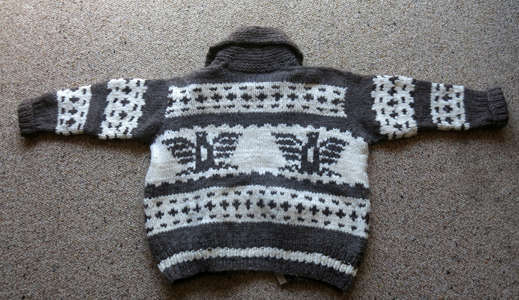 A Gwiis Halayt could only be worn by Simgitgat (chiefs). The weaving of this type of 'Chilkat' dancing robe originated with the Nisga’a. 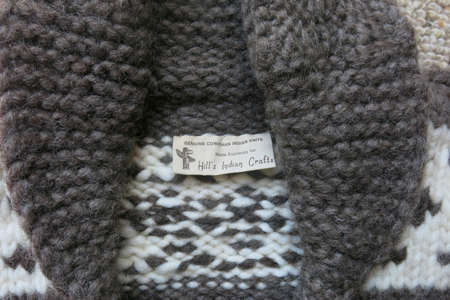 Each blanket is made from dyed mountain goat wool and cedar bark, and required as much as a year to complete. 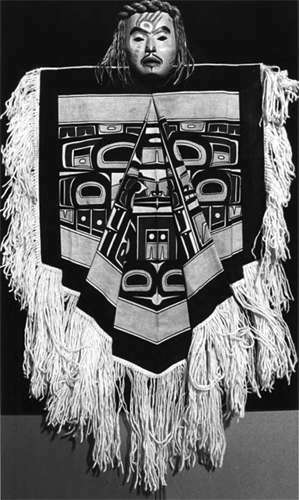 The complex design is an ayukws (crest) of a Nisg-a’a wilp (house). 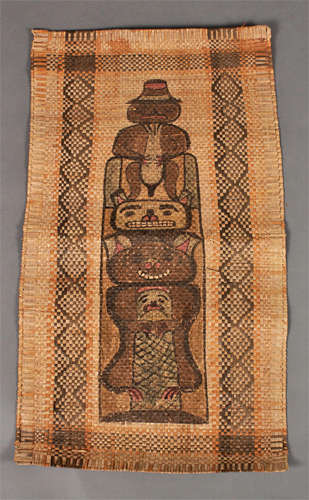 Acquired at Lax-g-alts’ap, likely from a sim’oogit of Ank’idaa, 1905. The overall design of these robes, often called Chilkat blankets, is very standardised, although each one is unique. 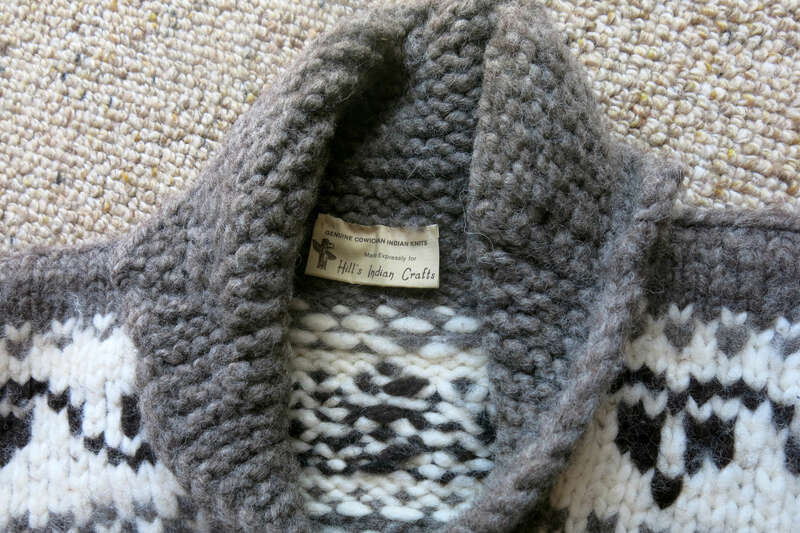 They are superbly made, with mountain goat's wool completely covering a core of shredded and twisted cedar bark. 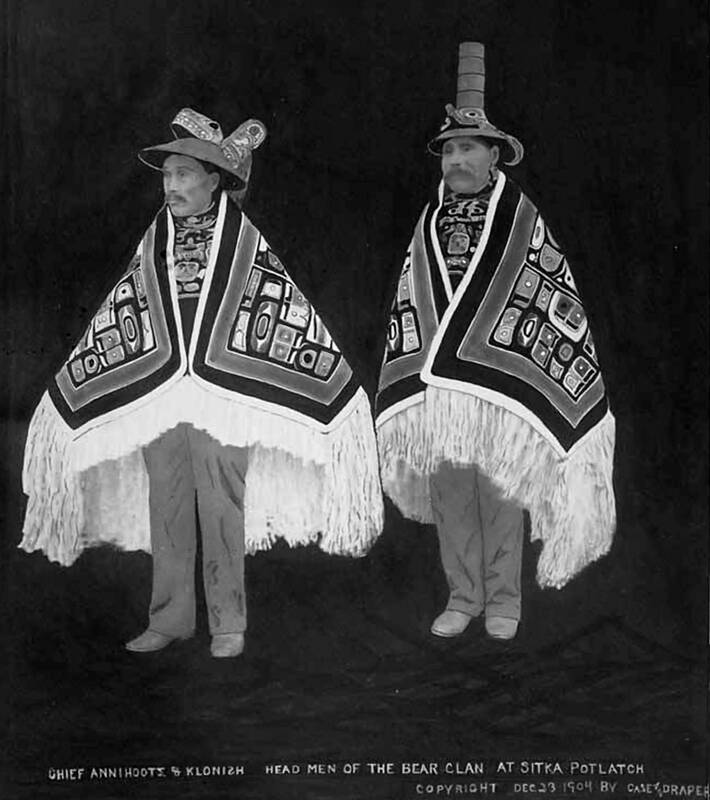 The two men are wearing Chilkat blankets and hats; full length; black background. Photograph heavily retouched by creator. Photographer's number 101. 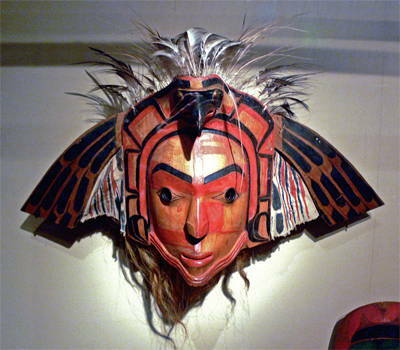 Mask and blanket display - art works created by students of the Gitanmaax School of Northwest Coast Indian Art located at the 'Ksan Historical Village. Permission: Courtesy George MacDonald, Director, Bill Reid Centre for NWC Art Studies at Simon Fraser University, Vancouver, BC. Mrs. Morrison in a button blanket. 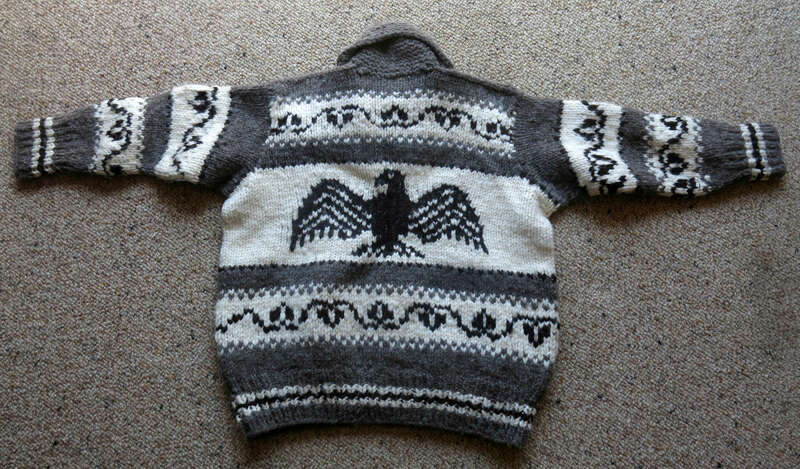 The pole crest on other blanket is after a pole at Kisgegas. Ksan carvers and dancers, Walter Harris with back to camera, Art Strerrit dancing with mask in background. Ksan village. 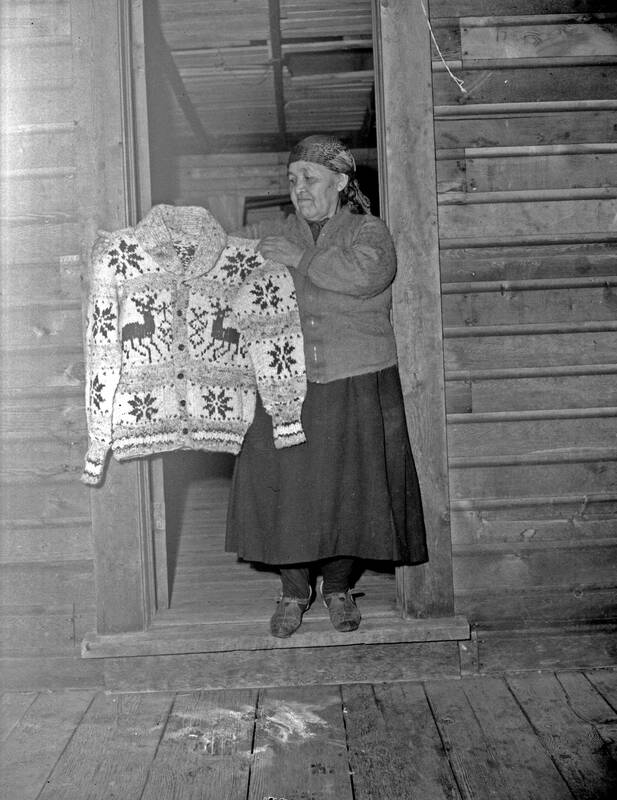 Cowichan Indian Sweater Maker, between 1941 and 1943. 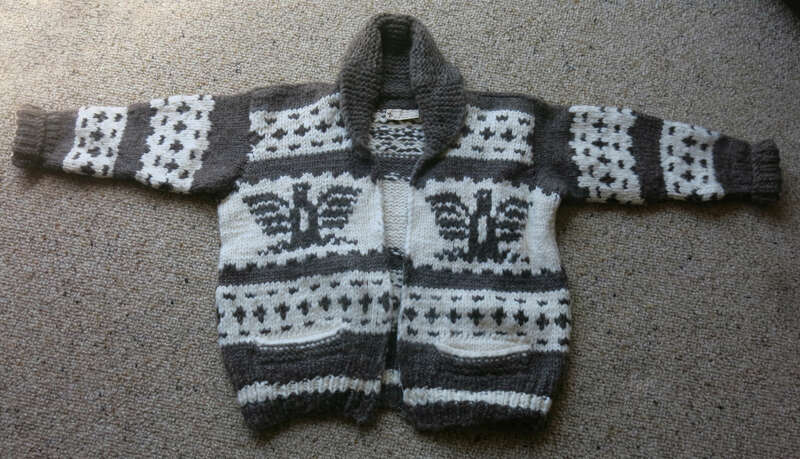 The fashion in Canada is for a cardigan style, opening sweater. 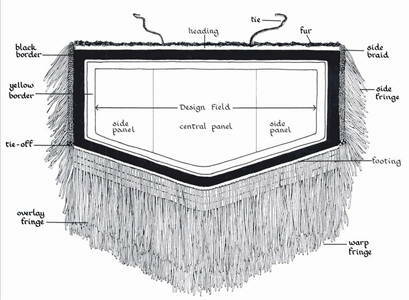 Originally a buttoned closure was used, though now a zippered closure is the norm. 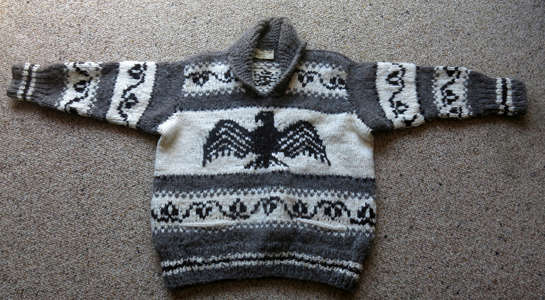 Preferring the unzippered style of sweater, I had this 'Thunderbird' motif sweater specially made for me when I lived in Canada, ordered through the Hudson's Bay Company Department Store. The label has yellowed a bit in 47 years, but the sweater is as good as new. The Hudson's Bay Company, commonly referred to as 'The Bay' is the oldest commercial corporation in North America (in continuous operation for over 340 years) and one of the oldest in the world. 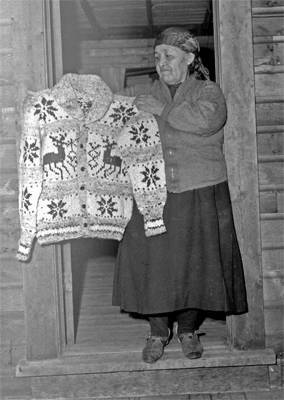 A fur trading business for much of its existence, today the Hudson's Bay Company owns and operates retail stores throughout Canada and the United States. Note that the label has not changed its design in at least 34 years. Cowichan wool being hung to dry, between 1941 and 1943. The 'Ksan Performance group re-enacting the story of the warrior chief Nehl'xt or 'Nekt at 'Ksan Historical Village. The story takes place at 'Battle Hill' near Gitwangak village. 'Nekt was an aggressive warrior and led many successful raids against neighbouring tribes. 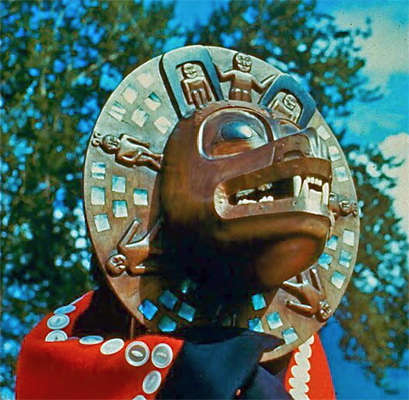 He is remembered and celebrated by the Gitxsan people as a powerful and great leader. 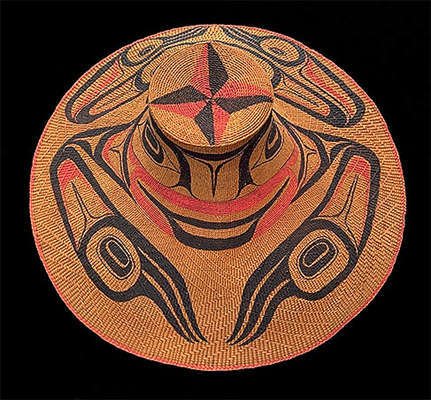 The hat is of classic tapering form, very finely and tightly woven in split spruce root, in three-strand skip stitch twining techniques, with a concentric zigzag pattern on the brim, a smoother texture on the head covering the crown, overlaid by painted totemic crest designs in red and black pigments. Decorated around the crown with mirror-image totemic animal effigy motifs. A woven cedar bark hat, hand painted with a frog, by Charles Edenshaw. The four-pointed star with bicoloured points is the signature of this artist. 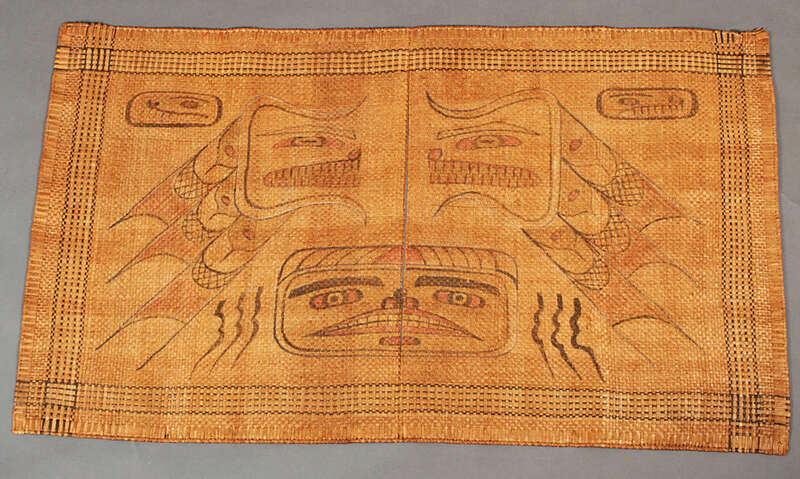 Collected at Masset in 1911 by C. C. Perry. 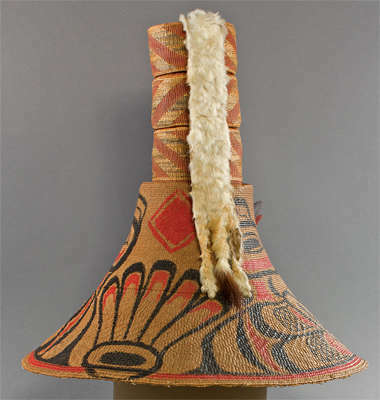 Raven Hat with Hat Ornament, ca 1900, wood, spruce root, and paint. 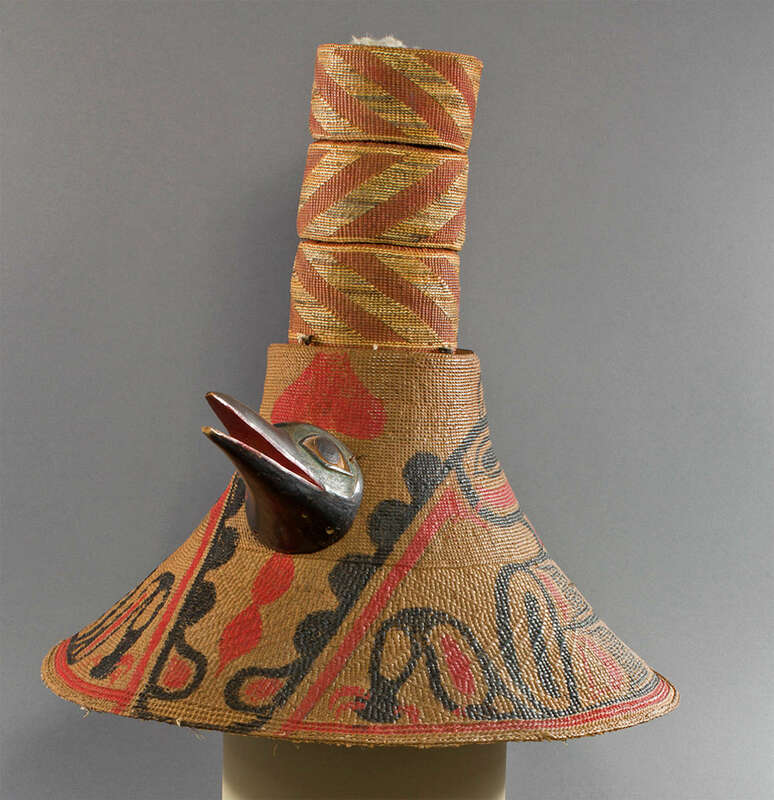 This hat is an excellent example of the High-Crowned or Ringed Hat. 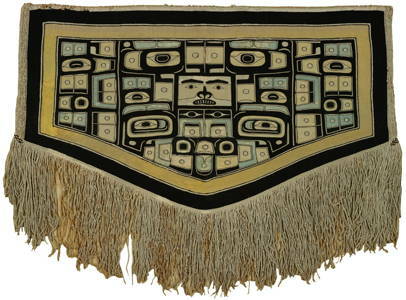 It was worn by high ranking Haida and Tlingit people. 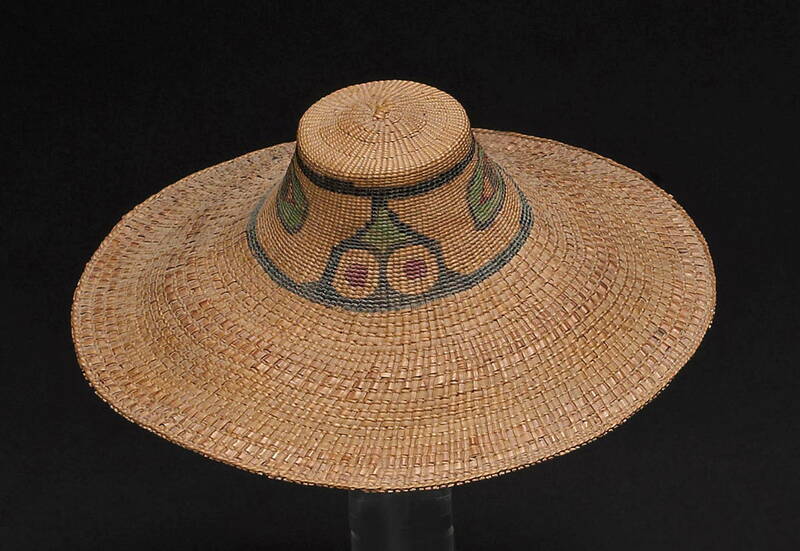 Finely woven of split spruce roots, the wide brimmed hats have several woven cylinders topping the crown. These cylinders are called skils by the Haida. 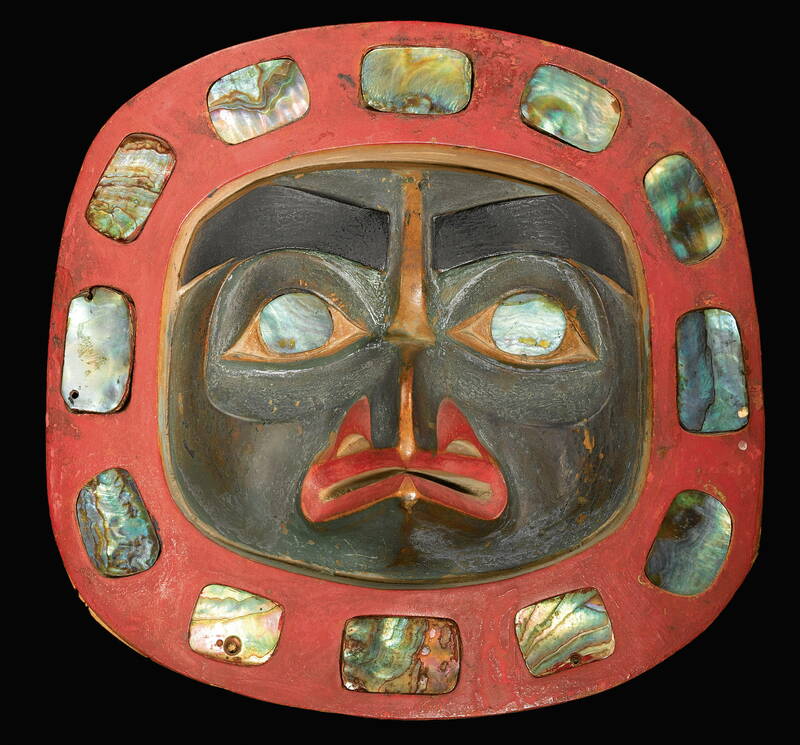 It is thought that the number of cylinders, or rings, represents the number of potlatches given by the owner, thus the term 'potlatch rings' or 'potlatch cylinders'. Another theory is that a specific number of rings or cylinders was, in itself, a crest. This seems quite probable, since some of these hats, painted with the family crests, were crests themselves. Certainly, the high crowned or ringed hat points to chiefly status and high rank, and poles that include these hats symbolise the status of the chiefs on whose poles they are carved. Occasionally, a plain column of such rings was carved on a pole, in association with a figure, human or animal; or a whole section of a pole was carved to represent the stacked cylinders. Unknown Haida artist, Mat, ca. 1890, painted cedar bark. Unknown Haida artist, Rattle Top Basket, ca. 1900, spruce root and grasses. These baskets took up to 300 hours to make, and the lid had small pebbles or lead shot in it so that it rattled when shaken. They were made in winter. 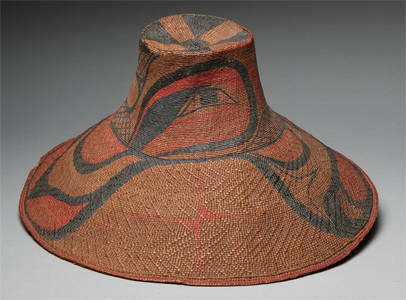 They are generally called a spruce root twined rattle top basket, made of a mixture of spruce roots and native grasses. 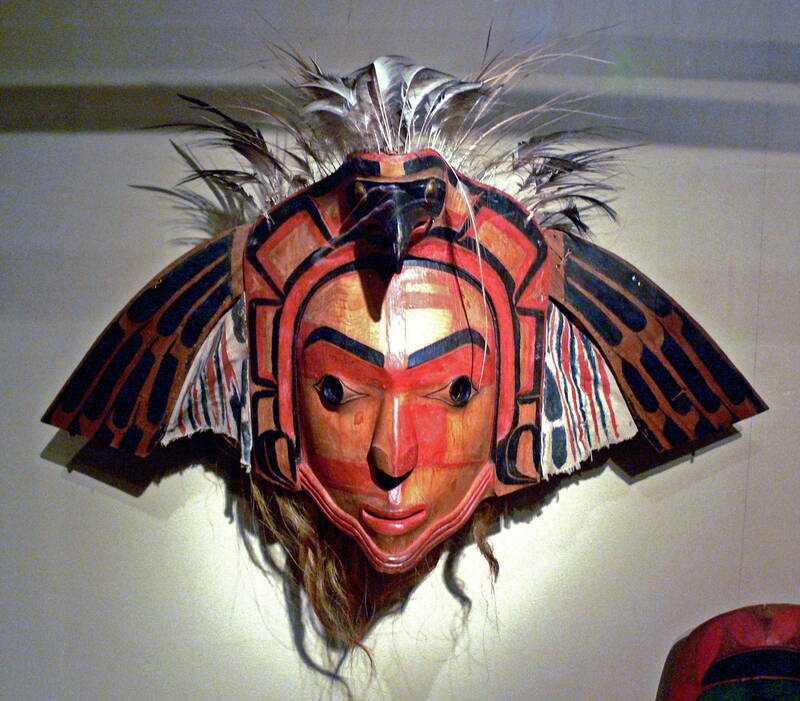 They were highly valued, and were a great source of revenue for many west coast peoples including the Tlingit. In the spring the women would go and strip the roots of the Sitka spruce. The delicate baskets have a lot of stitches per inch. 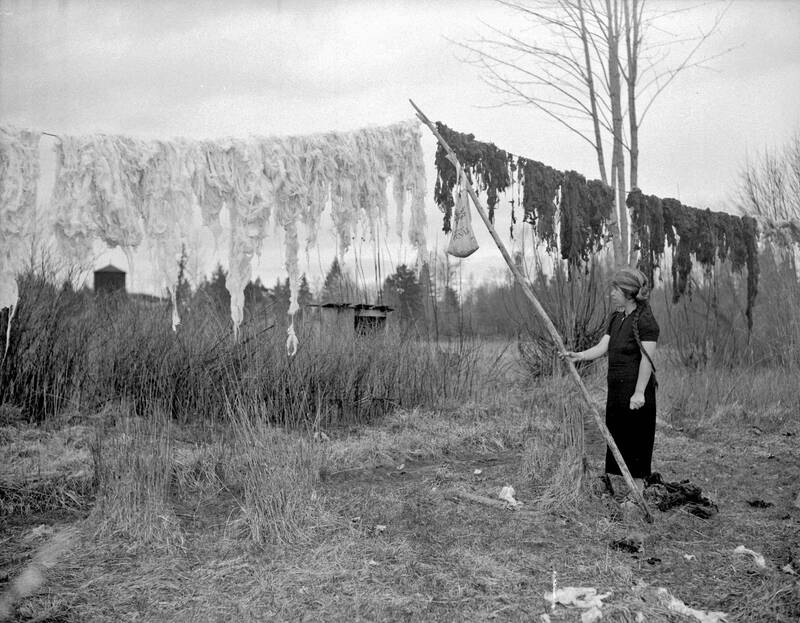 The colours may be aniline dyes, which came in during the 20th Century. 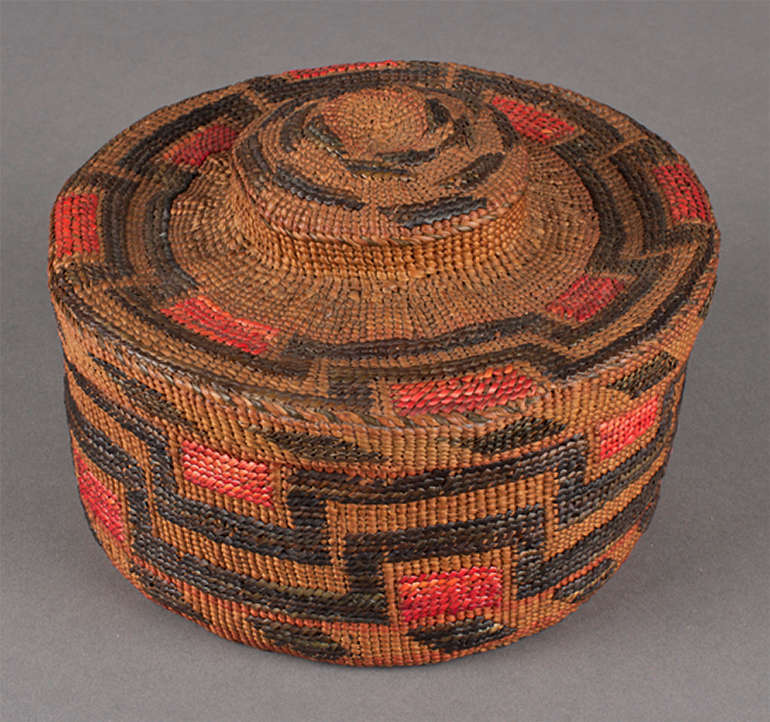 The baskets are flexible, and often examples have breaks on the rims, and they break easily on the seams. Attributed to Kadyisdu.axch', Tlingit, Kiks.ádi clan, active late 18th – early 19th century. Notes:	There are human figures crouching within Raven's ears. Portrait Mask, ca. 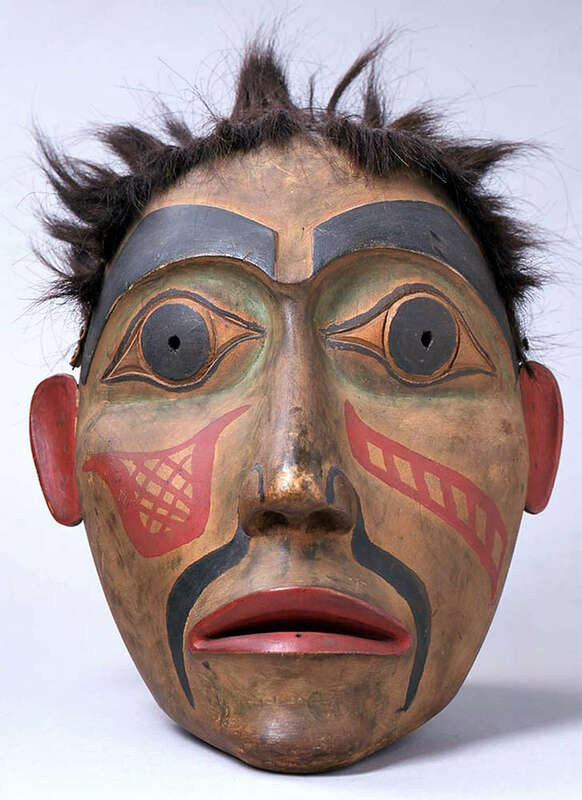 1900, unknown Haida artist, wood, paint, and hair. This frontlet, (band worn on the forehead ) of slightly convex form, is finely carved with a bird, probably a raven, with recurved beak, high pointed cheekbones, and pointed oval eye rims inset with rich blue green plaques of abalone shell as pupils beneath sharply arching brows, enclosed by a deeply recessed groove, surmounted by a flattened border, painted in vermilion red and inlaid with plaques of abalone shell. Height 6 1/2 in, 16.5 cm, Width 6 1/4 in, 16 cm. The mask is composed of carved wood and pigments, probably a representation of a human/hawk hybrid; pierced twice at each side and tied with hide straps for suspension. Height 9 3/4 in, 25 cm. 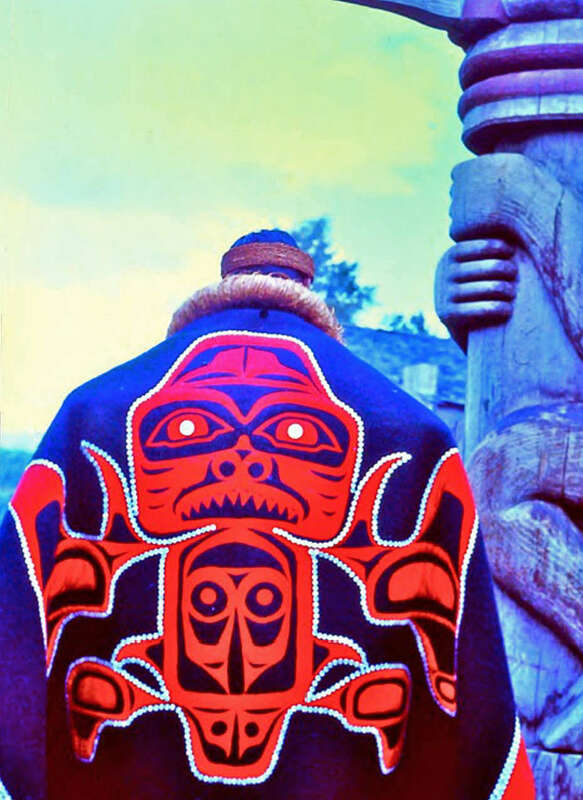 Stewart, H., 1993: Looking at Totem Poles, Douglas & McIntyre, 01/01/1993 - Indians of North America - 191 pp.